This doesn’t have to be your experience. I’ve successfully built a 6-figure insurance based practice by being strategic and intentional. Referrals. Fill your practice with your ideal clients. Let’s face it, how many of our clients (us, too) can afford to pay out of pocket each week? Furthermore, WHY pay out of pocket when more people have access to healthcare than ever before. Being an in network provider can insurance the amount of referrals that you receive. Flexibility. Accept insurance to create your ideal schedule. Yes, that’s right. Utilize your presence on insurance panels to fill daytime hours. Your status as an in network provider can be an assist used to target and partner with companies in your area whose employees you are interested in serving. 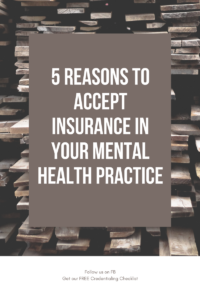 If you’re looking to credential your practice but you’re not sure where to start, check out our Credentialing Checklist to get you started or apply to join our DIY Insurance 101: Getting Paneled for Mental Health Professionals Course. Next Next post: NPI-1 and NPI-2. Do I need both?